Ambience – The atmosphere of a place; the mood or special quality. You could be in the most beautiful place, but it may lack atmosphere and character. The ambience of your home could be what’s missing. But, how do we create ambience in our home? There are so many different elements to consider. No matter what time of year it is, I still want to relax and feel cosy at home. Somewhere I can truly switch off from the world, put my feet up and snuggle with a cup of tea (wine). But my surroundings are everything. I can’t relax unless my home is clutter free and clean. It may seem obvious, but the reality of maintaining a tidy, clean home is difficult. If you are looking for daily cleaning tips, have a look at my blog post here. Now, clean and tidy are two different things, for me, getting rid of the mess and clutter are essential to be able to kick back and relax. Have a place for the children’s toys, clear the floor, straighten the cushions and fold the blankets. It really won’t take you long if you have a quick routine, even if it’s spending 20 minutes tidying after the kids are in bed and before you sit down. It’s difficult to get motivated to get back up if you sit down first! A tidy environment will give you a tidy mind! Let’s consider your lighting, is it too bright, or worse, too dark? I never have my main lights on at home when I’m relaxing. I have lots of lamps around my home which provide a soft glow, both during the day and evenings. I do love my main lights, therefore they all have dimmers which can be dulled down low to allow them gently glow and show off their sparkle even more so, at night. It really is incredible what a huge difference lighting can make. A good photo is nothing without good lighting. These beautiful lamps below are from Melody Maison. I have a whole blog post on how to make your home smell beautiful, you can find it here. This is absolutely essential for me and is one of the main elements I consider when having guests over. I want my home to be delicately scented, noticeable, but not overpowering as your taste may differ from the rest of the household. Fragrance is key to making your feel relaxed and appreciating your surroundings. I rave about Scentsy wax melts all the time because they’re the best. You can buy an array of beautiful warmers, some which light up and look like pretty ornaments, housing the fragrance of your choice. You name it, Scentsy will have it, from coconut to creamy vanilla and lavender to luscious pineapple, there will be a scent you will love in love with. I buy all of my Scentsy products from Carrielom1409 and she is fabulous! Whilst we’re on the subject of fragrance, candles are of course a perfect way to achieve a lusciously scented room. My firm favourite at the moment is still my beloved Plum and Rhubarb from Daisyblue Candles. Of course, the ambience isn’t just created by the scent, but the flickering flame, bringing warmth and atmosphere in abundance. At the weekend, I go all out and light every single tea light and lantern in my living room. I just love put my feet up and pour myself a prosecco and enjoy my pretty surroundings! If I want to relax, I look no further than Thai Lemongrass. A beautiful concoction of lemon and gentle ginger. It’s like a spa and I cannot get enough! We all love music in our homes when the mood suits. Whether it’s something soft and romantic during your evening meal or something cheesy and uplifting to help you wade through your ironing pile. Music is so accessible and easy these days. We invested in an Alexa Amazon Echo at Christmas and it’s still a novelty to simply shout out a song and it comes on immediately! Not to mention Sofia uses it to ask her homework answers – cheeky! Gone are the days where we used to sit with tapes and record the top 40, cutting out the DJ in between with a nifty stop and record action! We also have in built speakers in every room so that our song choice plays throughout the house. It’s really lovely on a Saturday evening to enjoy whilst cooking our dinner and adds to the relaxed, weekend vibes! Adding some fresh flowers in a decorative vase to your home is a real treat, it’s not something I do regularly. I have so many faux arrangements that I adore, but every now and again, it’s a special touch you can add to create a pretty, homely feature. 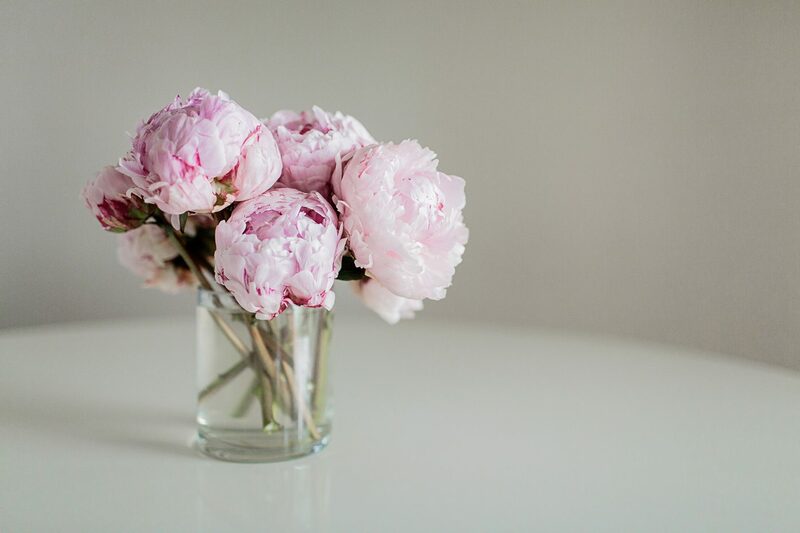 Of course, my favourite flowers are pink peonies! Recently, my husband surprised me with a delivery of these with a little card which read ‘To my very own Pink Peony’. They took pride of place in my living room and made me smile each time I came home! Have a look around your home, do you have clashing colours or patterns? I believe neutral tones are the best to choose, particularly in room where you want to relax such as your bedroom and living room. It’s no secret that I’m in love with grey and silver. I also love beiges and golds and soft pinks too. It’s not that you shouldn’t have colour in your home, but opt for pops of colour, introduced in forms like cushions, rugs and fresh flowers. That way you have a lovely, calm, neutral palette that you can switch up with gentle colour for the changing seasons. I made the change from laminate flooring to soft carpet a couple of years ago and I will never look back. I have isense carpets throughout my home, which in my view are the absolute best carpets on the market. This price tag can be eye popping, however the quality is second to none. It’s a complete joy to walk upon and aesthetically pleasing. It’s thick, bouncy and silky soft and makes coming home even more inviting. Of course, you may not be in the position to get carpet, or you may enjoy the practicality of having laminate or maybe you’re lucky enough to have original floorboards in your home! However, you could add a beautiful cosy, fluffy rug underfoot on areas such as beside your bed and beneath your sofa to dig your toes into when relaxing in the evening. I’ve saved my favourite until last. I absolutely adore a fireplace. I love to sit by a real crackling fire, I love gas fires and I love an electric one too. There are so many amazing ones on the market now which look true to real life! After falling in love with so many on the Instagram home community pages, I decided I needed a new one for my dining room. It arrived swiftly, by a palette delivery, contacted by the driver prior to delivery to ensure this delivery slot was suitable. I couldn’t wait a minute longer and had my poor husband hang it as soon as he got home despite the much anticipated world cup opening game being on! The fire itself is extremely easy to secure onto the wall, it comes with an easy to install frame to simply hook the fire on to. The fire itself simply plugs into a socket and you’re ready to play around with your brand new toy! It comes with a remote control to choose mood lighting, heat output (which you can set on a timer), flame colour and intensity. You can also choose which type of beads and glass you fancy! I chose white and glass beads. I love that you can change all of this from your sofa using the nifty remote control. You can alter all of the settings to suit your mood. On a Saturday evening I like to have the soft purple backlight which lifts the room and provides a unique, relaxing atmosphere. I chose the white and glass stones option. However, I decided to only used the glass as they looked like delicate little crystals which come in two sizes and glisten under the light. The flame has several options from high to low. The colour itself can be a fiery orange, which I’m imagining will look spectacular on Christmas eve, glowing beside my Christmas tree! You can also have it an electric blue to put you in the party mood, or a soft pink/orange, which is my favourite. The ambient mood lighting can be set to any colour you can imagine. I love the soft white glow! I’m over the moon with my new fire. It’s a real focal point of the room and makes me want to host a dinner party soon! So have a look around your home. What tweaks and additions can you make to ensure that your ambience is as delightful as you envisage it to be! Take pride in your surroundings and create something unique. * This post was in collaboration with Bell. As always, all opinion expressed are my own.